The Zhou Dynasty (Chinese: 周朝; Pinyin: Zhōu Cháo; Wade-Giles: Chou Ch`ao) (1022 B.C.E. to 256 B.C.E.) followed the Shang (Yin) dynasty and preceded the Qin dynasty in China. The Zhou dynasty lasted longer than any other in Chinese history, and the use of iron was introduced to China during this time. The dynasty also spans the period in which the written script evolved from the ancient stage as seen in early Western Zhou bronze inscriptions, to the beginnings of the modern stage, in the form of the archaic clerical script of the late Warring States period. The Zhou introduced the notion of the Mandate of Heaven, that is, that the king or emperor reigned as the direct representative of the gods. The belief developed that the earthly bureaucracy mirrors the heavenly, with the earth as the yang (masculine) aspect and heaven as the yin (feminine) aspect. It was essential to maintain harmony and balance between the two spheres, and what happens on earth influences heaven, and vice-versa. The ideal is to live life in harmony with forces of the universe, to flow with, not against, the natural rhythms of life and of nature (wu-wei). Thus, at a very early period, the Chinese developed an empathetic relationship with the natural world, which respected nature. The long-lasting Zhou dynasty gave stability to a large area of China for almost a millennium, allowing people to develop a sense of mutual responsibility and a shared view of life. Family responsibilities and duties towards the state were stressed. The concept of the Mandate of Heaven has something in common with the European doctrine of the divine right of kings, except that as that developed in medieval Europe (almost two thousand years later) it saw rebellion against the king as an unthinkable sin. The Chinese dogma recognized from the outset that the ruler could forfeit the Mandate, if his rule did not benefit the people. This was also emphasized by the great teacher, Confucius (551-479 B.C.E. ), who lived during the Zhou dynasty at Lu, where he advised the government. He advocated humane co-operation, politeness and virtuous living (Ren, ethics, humaneness). Instead of coercing his subjects, the ruler should love them and lead by setting a virtuous example. Confucius taught that a polite, well ordered society in which everyone had a prescribed role, would banish hatred and war. Contemporary governments too often allow vested interests to dominate their agendas and to influence their policies for the benefit of these interests rather than of the electorate. The radical idea that rulers should love their subject, and work for their welfare, was alive and well in China during the Zhou dynasty. Those who understand history from a providential point of view could well conclude that the length of the Zhou dynasty's reign was a consequence of their enjoying the Mandate of Heaven. In the Chinese historical tradition, the rulers of the Zhou displaced the Shang and legitimized their rule by invoking the Mandate of Heaven, the notion that the ruler (the "son of heaven") governed by divine right (granted by the Supreme God of Heaven) but that his dethronement would prove that he had lost the mandate. The doctrine explained and justified the demise of the Xia and Shang dynasties and at the same time supported the legitimacy of present and future rulers. The Zhou dynasty was founded by the Ji family and had its capital at Hào (near the present-day city of Xi'an). Sharing the language and culture of the Shang (Yin), the early Zhou rulers, through conquest and colonization, gradually extended Shang (Yin) culture through much of China Proper north of the Yangtze River. According to the Zhou, the Shang had ruled unethically, squandering the resources of the kingdom. The mandate required rulers to rule justly. Each succeeding generation had to justify the dynasty's continued claim to hold the mandate. Negligence and abuse could revoke the mandate. The will of the people, ultimately, sanctioned the king's rule. In the West, the Zhou period is often described as feudal because the Zhou's early rule invites comparison with medieval rule in Europe. However, historians debate the meaning of the term feudal; the more appropriate term for the Zhou Dynasty's political arrangement would be from the Chinese language itself: the Fēngjiàn (封建) system. The Zhou amalgam of city-states became progressively centralized and established increasingly impersonal political and economic institutions. These developments, which probably occurred in the later Zhou period, were manifested in greater central control over local governments and a more routinized agrarian taxation. Initially the Ji family was able to control the country firmly. In 771 B.C.E., after King You of Zhou had replaced his queen with a concubine, the capital was sacked by the joint force of the queen's father, who was the powerful Marquess of Shen, and a nomadic tribe. The queen's son, King Ping of Zhou, was proclaimed the new king by the nobles from the states of Zheng, Lü, Qin and the Marquess of Shen. The capital was moved eastward in 722 B.C.E. to Luoyang in present-day Henan Province. Because of this shift, historians divide the Zhou era into the Western Zhou (Xī Zhōu), lasting up until 771 B.C.E., and the Eastern Zhou (Dōng Zhōu) from 770 up to 256 B.C.E. The beginning year of the Western Zhou has been disputed—1122 B.C.E., 1027 B.C.E. and other years within the hundred years from late twelfth century B.C.E. to late eleventh century B.C.E. have been proposed. Chinese historians take 841 B.C.E. as the first year of consecutive annual dating of the history of China, based on the Records of the Grand Historian by Sima Qian. 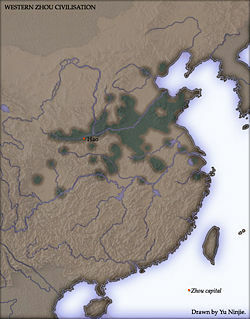 The Eastern Zhou corresponds roughly to two sub-periods. The first, from 722 to 481 B.C.E., is called the Spring and Autumn Period, after a famous historical chronicle of the time; the second, which extends slightly past the 256 B.C.E. end date of the Eastern Zhou, is known as the Warring States period (480 to 221 B.C.E.). This discrepancy is due to the fact that the last Zhou king's reign ended in 256, 35 years before the beginning of the Qin dynasty which ended the Warring States period. With the royal line broken, the power of the Zhou court gradually diminished; the fragmentation of the kingdom accelerated. From Ping Wang onwards, the Zhou kings ruled in name only, with true power lying in the hands of powerful nobles. Towards the end of the Zhou Dynasty, the nobles did not even bother to acknowledge the Ji family symbolically and declared themselves to be kings. They wanted to be the king of the kings. Finally, the dynasty was obliterated by Qin Shi Huang's unification of China in 221 B.C.E. The Zhou had always had a concern for unity but in the end they could not sustain the unity of their empire, and lost the mandate of heaven. Agriculture in Zhou dynasty was intensive and in many cases directed by the government. All farming lands were owned by nobles, who then gave their land to their serfs, similar to European feudalism. For example, a piece of land was divided into nine squares in the shape of the character for "water well," jing (井), with the grain from the middle square taken by the government and that of surrounding squares kept by individual farmers. This way, the government was able to store surplus food (such as rice) and distribute them in times of famine or poor harvest. Some important manufacturing sectors during this period include bronze making, which was integral in making weapons and farming tools. Again, these industries were dominated by the nobility who direct the production of such materials. The Zhou dynasty left a rich legacy. It gave stability and a large measure of peace to a large area of China from the eleventh to the third centuries B.C.E. During this period, the people developed a culture and a way of life and a world-view that bound them together within a common universe. This paved the way for the unification of China by the Qin king, Shih Hunag-ti in 221 B.C.E. Confucius, who lived during the Zhou dynasty, laid the foundations of what became Confucian thought, much of which concerned the correct ordering of society. Much Chinese thought focused less on individual issues of morality, although they were discussed than on social responsibility, on the duties of subjects and rulers. Morality and benevolence were key concerns. A fundamental concern was balance and harmony, within society, between the rulers and the ruled, heaven and earth, the human and natural worlds. At the heart of Confucius' teaching was the concept of the (chun-tzu) (gentleman), who has cultivated wisdom (chi), love of humanity (ren), courage (yung) and righteousness (yi). Confucius championed the idea that education can improve the individual and that if all people were educated, universal peace would become a reality. Confucius was a shih, a new type of civil servant whose appointment was based on ability, not birth. Laozi also lived during this period, possibly born in 600 B.C.E., from whose teaching Daoism developed. Laozi is famous for his concept of wu-wei—that is, ride nature, do not try to conquer it. By going with the flow, opposites can be reconciled and ethical conduct becomes natural. He taught that that reality is two-sided; yin (feminine; dark, cool, moist) and yang (masculine; hot, dry, bright). Both are necessary and equal and nothing is exclusively either (all are a blend of both). These (and all apparent opposites) need to be kept in balance and harmony to avoid chaos. sponsored by the Chinese government which reported in 2000. They are given only as a guide. advance and so King Nan is widely considered to have been the last emperor of the Zhou dynasty. Schirokauer, Conrad, and Miranda Brown. A Brief History of Chinese Civilization. Florence, KY: Wadsworth Publishing, 2006. This page was last modified on 3 July 2013, at 14:16.